Andy started out at the Coventry City Academy and during his time with them, played for the England Youth team alongside Theo Walcott. 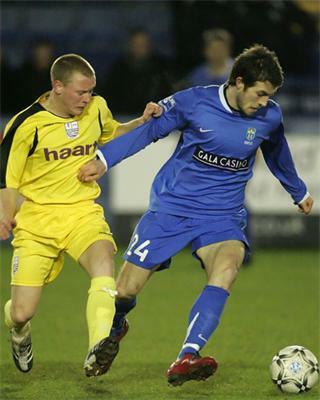 The midfielder failed to break into the first team squad however, and went out on loan to Burton Albion in August 2007. He was eventually released during a few months later, and joined Rushden & Diamonds on 25 January 20, initially on non-contract forms, but then signed within a week until the end of the season. After sixteen appearances during the season, manager Garry Hill decided to release him in May and he joined Conference North side Hinckley United in July 2008, where he remained for two seasons. On 29 May 2010, he moved to fellow Conference North side Corby Town, and achieved notoriety when he was sent off in the game at Blyth Spartans on 21 August 2010 before ever making an appearance after tripping up the referee’s assistant while warming up! After serving his suspension, he only made three appearances before going out on loan to fellow Conference North side Solihull Moors on 20 October 2010. On his return, he went out on another loan deal on 1 January 2011, this time back to Hinckley United until the end of the season. Andy re-signed for Solihull Moors on 15 June 2012 on a one-year deal, but left the club by mutual consent on 5 November 2012 to sign for Southern League Premier side Bedworth United. He departed at the end of the season, andit was announced on 5 June 2013 that he would join Southern League Division One Central side Kettering Town for the forthcoming season. After three seasons at Kettering he moved to Rugby Town for the 2016-17 season but left there within two months.